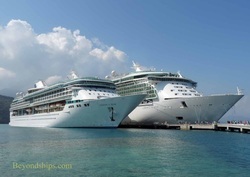 Docked side by side, the difference in the size of the ships becomes quite apparent. 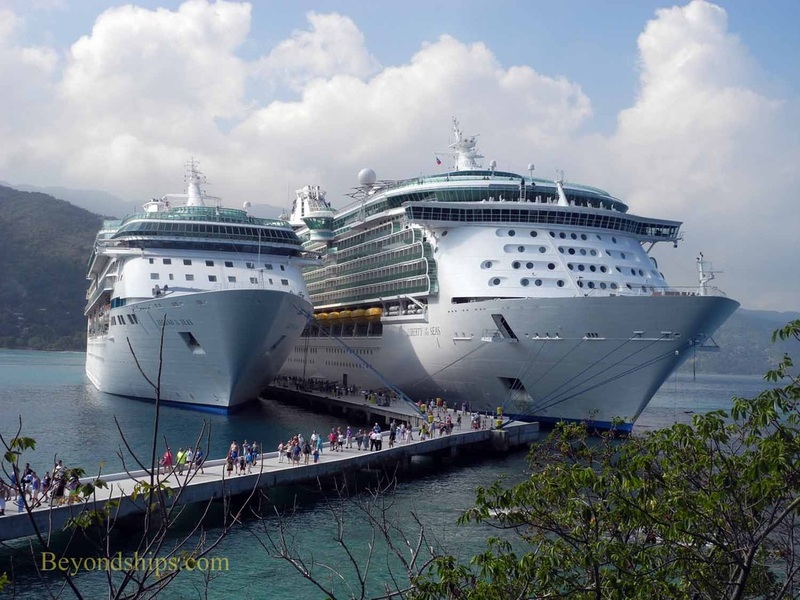 Legend, the second ship in Royal Caribbean's Vision class is about 70,000 gross tons. Liberty, the second ship in Royal's Freedom class, is approximately 154,000 gross tons. Thus, Liberty is more than twice the size of Legend. Berthed on the outer side of the pier, Liberty is able to pier around the end of the Labadee peninsula towards the Dragon's Rock Cafe. Legend has a sleek bow and is one of the fastest ships in the Royal Caribbean fleet. She has been clocked at 25 knots. However, for most itineraries, she only needs to do 18 knots or less. By late in the afternoon, both ships have recovered their passengers from the resort. Liberty is the first ship to leave. After releasing her lines, she seems to drift away from the pier before getting underway and disappearing over the horizon.